CAST Navigation, LLC is a leading provider of GNSS/INS Simulation Systems for integration, test & training of navigation systems, inclusive of jamming & spoofing capabilities used to evaluate the impact of GNSS denial events with systems that use either single or multi-element antennas. 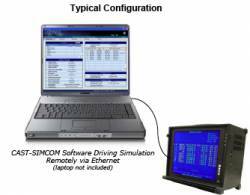 The company offers comprehensive man and hardware-in-the-loop solutions for simulating GPS and inertial data for integrating Embedded GPS/INS (EGI) equipment. Their equipment supports navigation system research, development, integration and testing for air, land, sea, space and weapon platforms in commercial, industrial and military laboratories worldwide. With 35 years of industry experience and commitment to integrity and pride, CAST provides optimal GNSS/INS solutions.